Crispy on the outside. Soft light and fluffy on the inside. Baked to absolute golden perfection in our signature pan. 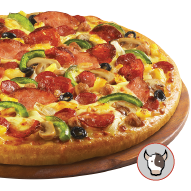 Experience a cheese explosion in every bite with parmesan and cheddar flavoured mozzarella cheese in the crust. 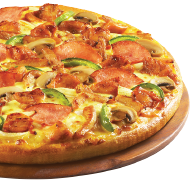 A fresh, hand stretched thin crust specially created with a lighter dough to bring out the full flavour of the Signature Series' premium toppings. 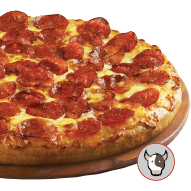 New and improved crust recipe. Crispy outside, fluffy inside. 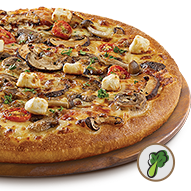 With toppings closer to the edge for the ultimate pizza indulgence. 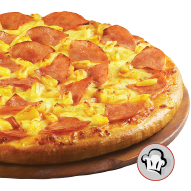 Experience a cheese explosion in every bite with mozzarella cheese in the crust. 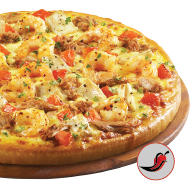 A fresh, handstretched thin crust specially made with a lighter dough to bring out the full flavor of the toppings. 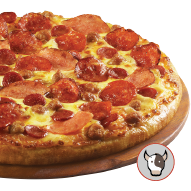 Combining the aromatic flavour of beef pepperoni and 100% mozzarella cheese, this is one classic treat that’s always a great choice. Italian classic meets local favourite. 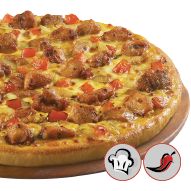 Spicy chunky chicken, potatoes, onions and diced tomatoes come together for an authentic flavour of rich spices. 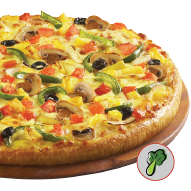 Delightful combination of garden fresh mushrooms, onions, olives and capsicums, sweetened with pineapple chunks and diced tomatoes. 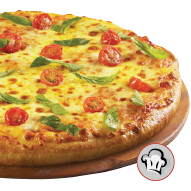 A classic recipe of fresh mozzarella, juicy sweet cherry tomatoes and fresh basil, baked in a tangy tomato sauce. 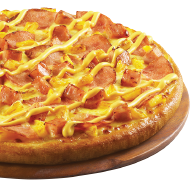 The perfect combination of chunky honey chicken ham and roasted pineapples with roasted onions, cream cheese and a drizzle of mango puree. 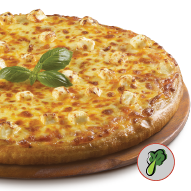 Send your tastebuds into a cheesy frenzy with a divine combination of four cheeses – mozzarella, parmesan, cheddar and cream cheese. 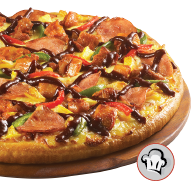 Marinated spicy chicken chunks, chicken ham, luscious pineapple chunks with fresh capsicums, baked on a sweet and smoky BBQ sauce.